Beach body, bikini body. Summer is almost here and everyone wants to get in shape – which usually means shedding a kilo or two. We know that traditional diets don’t work, but experienced nutritionists like me are re-discovering a way that does. Intermittent fasting – or chrono-fasting as it’s sometimes called. Read on to discover how it can help you lose weight and improve your health. Intermittent fasting is nothing new. It has been a traditional practice throughout history. Virtually forgotten until now, but if done right, this powerful dietary intervention has huge benefits that include weight loss, reversal of type 2 diabetes, increased energy and many other things. No. It’s all about control. Starvation means the involuntary absence of food, whereas fasting means withholding from food for spiritual, health or other reasons. In other words, you could eat, but you choose not to. You can fast for a few hours or a few days and you can stop whenever you want. You decide. Anytime you are not eating, you are fasting. Consider the term “break fast”. It means that you are fasting between dinner and breakfast the next day – usually for about 12-14 hours. Breakfast is the meal that breaks your fast. So, fasting is a normal part of everyday life. It’s probably one the oldest and most powerful ways of boosting our health – but these days we’ve forgotten how to do it and we ignore its enormous therapeutic potential. Simply put, fasting allows your body to burn off excess fat. We need to understand that this is perfectly normal and humans have evolved to fast without detrimental consequences to our health. Body fat is just energy from food that has been stored away for later use. If you don’t eat, your body simply “burns” this stored fat for energy. When we eat, we consume more calories than we can put to immediate use. Insulin is the hormone that stores the rest away. Remember that – insulin is a storage hormone! Its job is to store fat. Some of this food energy is stored in the liver. But that quickly reaches capacity. The rest is turned into fat and deposited around the body. Energy stored in the liver is easily accessible, but energy stored as fat is much more difficult to access and has unlimited storage space – as anyone who has struggled with their weight can attest. The process goes in reverse when we do not eat (fasting). Insulin levels fall, which tells the body to start burning stored energy as it’s no longer getting it through food. Blood glucose falls, so the body must now pull glucose out of storage to burn for energy.Energy stored in the liver can power our body for about 24 hours. After that it starts to break down fat as energy. Basically, our body is either in the fed (insulin high) mode or the fasted (insulin low) mode. Either we are storing food energy, or we are burning it. It’s one or the other. If eating and fasting are balanced, then you don’t gain weight. On the other hand, if we start eating the minute we get up and don’t stop until we go to sleep, we spend almost all our time in the fed state. Over time, we will gain weight because we never allow our body any time to burn food energy. To restore balance or to lose weight, we simply need to increase the amount of time we burn food energy. Fasting allows the body to use up its stored energy. It’s as simple as that. Diets complicate it – fasting simplifies it. Diets cost money – fasting is free. 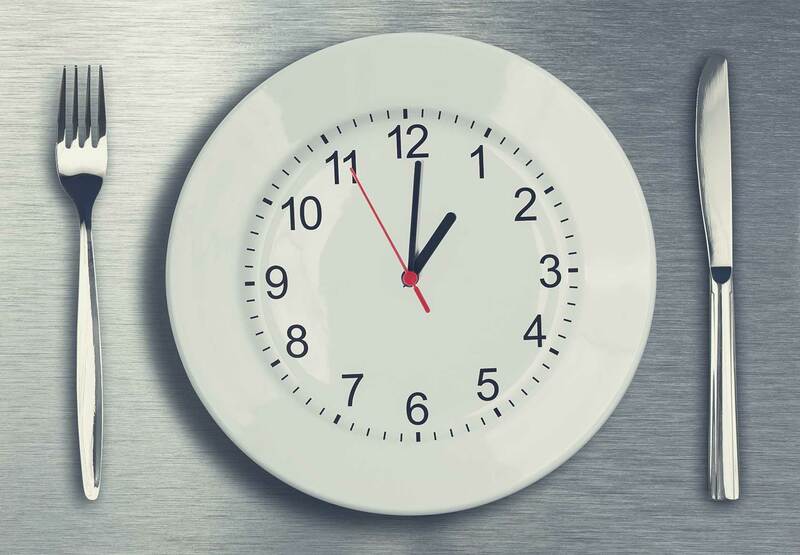 Diets take time – fasting saves time. Diets are limiting – you can fast anywhere. Diets don’t work – fasting does. As with any diet, for best results you need the guidance of a trained professional. More of an eating pattern than an actual diet, there are different ways to do it – usually either eating 500 calories one or two days a week or going twelve to eighteen hours a day without food (not as hard as it sounds! )A licensed nutritionist can help you decide what works best for you and plan accordingly. My preferred approach goes something like this; drink green tea or coffee in the morning, exercise, keep busy until 1:00 pm, eat a light, healthy, balanced meal (around 600 calories) and eat your evening meal early. One of the big advantages is that the mind is sharper and your mornings are more productive. After the initial “getting used to” period, you’d be surprised how easy it is. You might be wondering whether fasting will put you in starvation mode. The answer is no. Fasting increases basal metabolic rate. And it’s a myth that breakfast is the most important meal of the day. Since hunger tends to be lowest in the morning, skipping breakfast is the easiest meal to give up. Another important thing to remember is that hunger comes in waves. Despite what you might think, hunger does not continue to grow until it’s unbearable. Have a cup of tea and often it will pass. What’s more, once your body starts burning fat most people find that they’re no longer hungry. Intermittent fasting is an almost fool-proof way to lose weight. Still sounds too good to be true? Give it a try and see!